Each quarter, a brand receives an average of 9,052 inbound social messages that require a response. Any social media manager or social customer care agent knows that there’s a great deal of overlap in the Tweets a brand attracts. After all, great minds think alike—right? Your followers and fans are bound to take the words right out of each other’s mouths and ask the same questions or express similar feelings. Whether it’s a repetitive Tweet asking what time your restaurant starts serving brunch or an influx of entries for a social campaign, crafting and managing the same response over and over again without sounding robotic or disingenuous can be time consuming. This is where Suggested Twitter Replies from Sprout Social comes in. Available for Enterprise Plans and built on machine-learning algorithms, Suggested Replies create efficiency while maintaining authenticity and preserving your brand’s style and voice. What Are Suggested Replies, and How Do They Work? Suggested Replies analyze a brand’s Twitter history. They identify similar inbound messages, collect a brand’s replies to those messages, and then suggest a reply. Once a Suggested Reply is recognized, the account manager can choose from a short list of relevant responses that best fit the initial Tweet. All Suggested Replies have been created and published by the Twitter account owner, which eliminates the need for internal approval and expedites a brand’s response time. Account managers can edit a chosen response as they see fit, making it easy to personalize Tweets and call out specific customers, while maintaining a unified brand voice. Suggested Replies are only proposed when a match between a common, previous inbound Tweet and subsequent reply are detected. Sprout’s algorithm ensures that the functionality and accuracy of Suggested Replies are constantly evolving. 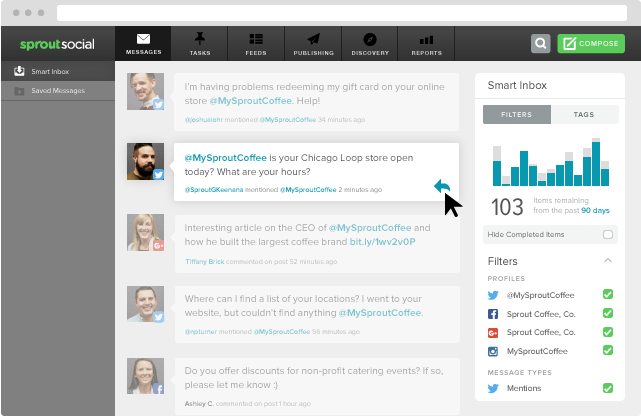 The more you use the feature, the more information it retains, and the better it gets at detecting replies. Suggested Replies are different from automated or canned responses, which store generic, drafted responses in a library of macros or saved text built and maintained by the account owner. Not only do automated responses feel impersonal and robotic, but they also take more time to aggregate, find and publish. What’s worse, you often cannot edit automated Tweets before they go live. How Are Brands Using Suggested Replies? So what are the benefits of Sprout’s Suggested Replies, and how are brands leveraging the feature to meet and exceed their social marketing objectives? Sprout recently surveyed more than 1,000 consumers who actively engage with brands on social and discovered that most people expect to hear back in under four hours. The average brand is failing its consumers by taking an average of 10 hours to respond to social inquiries. (highlight to tweet) When used effectively, Suggested Replies can help your business lower its response time, meet the demands of your followers, and, in turn, build brand loyalty. On April 21, 2016, Carvel celebrated its annual Free Cone Day by giving away free ice cream at all its locations. The company used #FreeConeDay to drive awareness for the promotion across its social channels. The day we’ve all been waiting for: #FREECONEDAY from 3-8 pm ET! Customers reacted with overwhelming enthusiasm, and the brand experienced a huge spike in social activity on Twitter as a result. Matt Courtoy, Carvel’s Social Media Manager, was able to keep up and meet the demands of followers, using Sprout’s Suggested Replies. When a branded hashtag experiences an increase in mentions, it’s important that followers aren’t being ignored. It’s also likely that an increase in hashtag usage is related to an unexpected crisis, earned media, or a social promotion—all scenarios that would likely garner repetitive inbound messages. For Monarch, a privately owned travel group in the United Kingdom, social customer care is key, especially on Twitter. Customer expectations are managed with transparency, and questions, concerns, and accolades are addressed with a distinct personality that’s become synonymous with the brand itself. The travel company keeps followers up to speed with the availability of its customer care agents to field customer inquiries, as well as with estimated wait times. 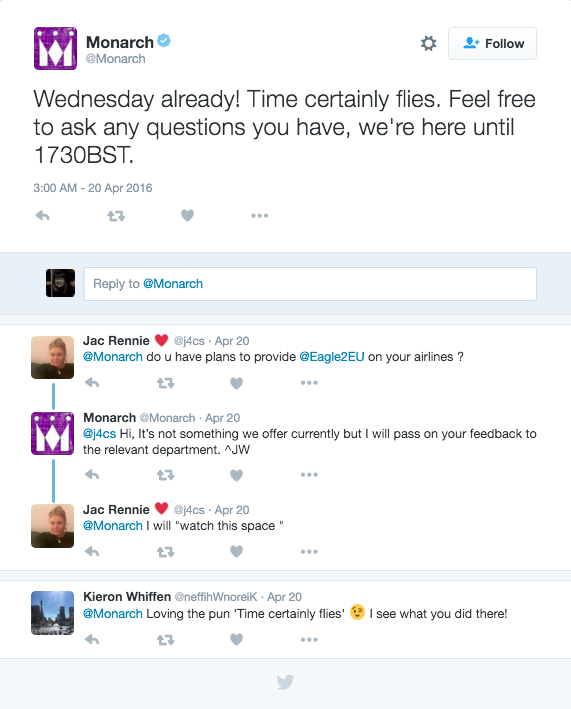 Monarch’s customer care agents use Suggested Replies to more efficiently identify and respond to common Tweets. Since Suggested Replies aren’t automated, the tool is more effective in that the suggestions have already been sent by Monarch’s customer care agents and match the brand’s conversational voice and tone. 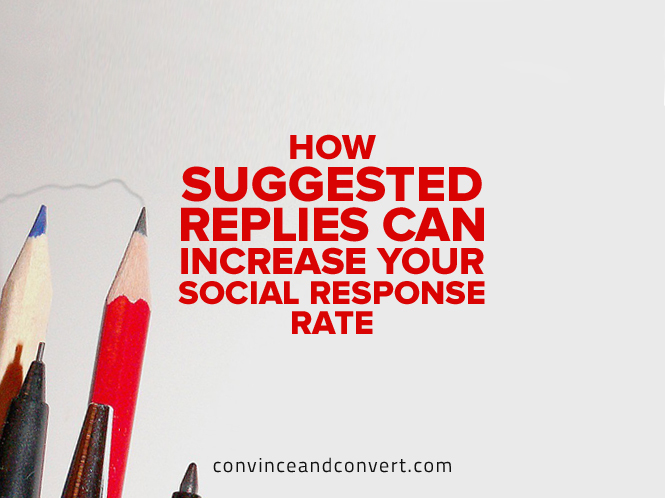 As with any social marketing strategy or Sprout feature, there are best practices to consider implementing when using Suggested Replies. Here are some tips for keeping the communication between your business and consumers authentic while speeding up your response time and allocating your internal workload. Streamline the client or legal approval process by leveraging Sprout’s machine-learning algorithm to intelligently suggest previously vetted replies, which can easily be personalized to maintain authenticity. Use Suggested Replies to improve your response rate and time for common questions that lend themselves to being quickly resolved on Twitter. 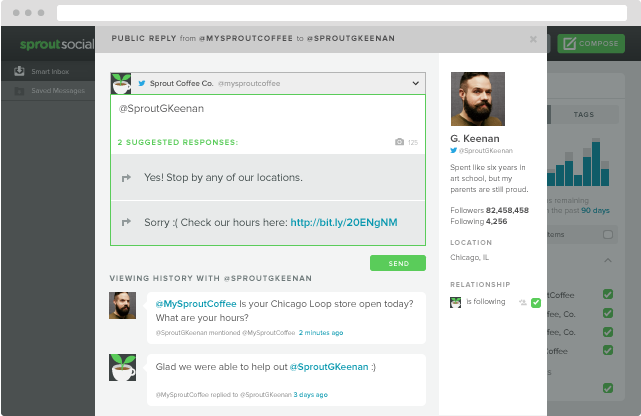 Sprout’s Engagement and Team Reports can be used in tandem with Suggested Replies to track team and agent performance. Control your team’s headcount, and equip your off-hours or skeleton crew customer care agents with the ability to keep up with inquires without sacrificing your average response rate or time. Suggested Replies maintain the intimacy and personalization of social media and help teams better manage and meet their consumers’ expectations. The messages that are being suggested have already been sent and approved by the account owner, so teams don’t need to worry about the common missteps that happen when brands evoke automation—a win-win for social media managers and consumers alike.